Hybrid low-cost carrier Skymark – Japan’s third largest airline – turned heads in early 2011 when it announced an order for six A380 superjumbo’s which will feature only 394 seats in a premium two-class configuration: 114 angled lie-flat Business seatss on the upper deck and 280 ‘shell-style’ Premium Economy seats on the lower deck. Skymark will take delivery of its first A380 in August 2014 and plans to fly between Tokyo and New York as the first destination, possibly followed by London and Frankfurt. 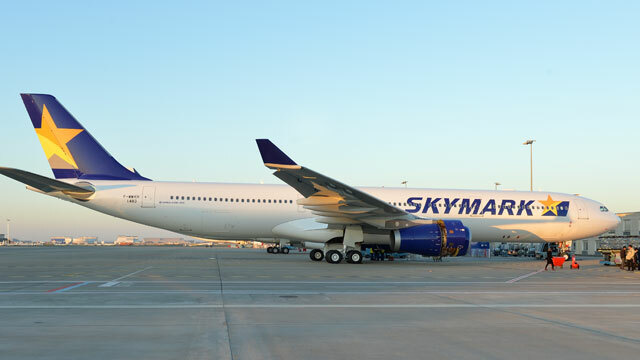 As part of Skymark’s ambitious expansion plan, the Tokyo Haneda-based airline also executed leases for seven A330-300 aircraft in July 2012, with delivery scheduled from early 2014 through 2015. Skymark’s new A330s are outfitted in a 271-seat single-class Premium Economyy configuration with a 38-inch seat pitch and a bit more than 19-inch seat width, called ‘Green Seats’ (after the more spacious seats offered in the ‘Green Car’on Japan’s high-speed rail), which are comparable to the domestic ‘Class J’ product of Japan Airlines. Skymark will deploy its Premium Economy-only A330 widebodies on key domestic trunk routes from Tokyo to Fukuoka and Sapporo to win market share among business travellers. The first route is due to be Tokyo Haneda-Fukuoka at the end of March 2014, which is Skymark’s busiest route based on available seats, and Japan’s second and the world’s third busiest air route. In mid-December, Skymark reveiled its new A330-300 interior at Airbus in Toulouse and we caught up with Daniel Baron, founder of Tokyo-based design agency LIFT Strategic Design who have been responsible for cabin styling and seat trim and finish, consulting on layout, seats and galleys. LIFT Design is also working with Skymark on the A380 cabin and seat design. 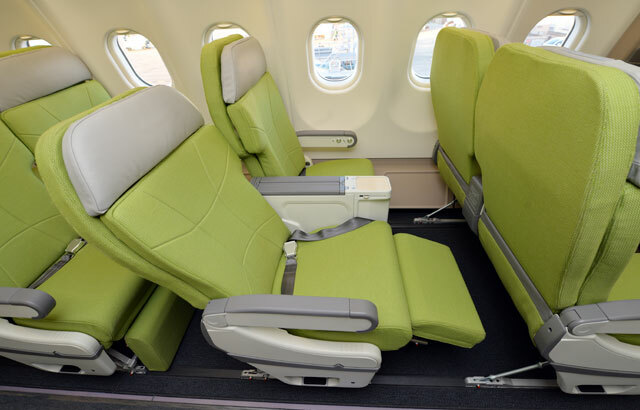 Skymark’s all-Premium Economy product features a 2 x 3 x 2 seating arrangement (compared with a regular 2 x 4 x 2 configuration for Economy on the A330). Each seat has 38 inches of legroom, which is long-haul standard for premium economy, and the 271 seats also feature leg rests – not just the front row like Cathay Pacific offers – meaning passenger’s legs are supported for the few hours they are onboard. There will be no inflight entertainment, but the airline says it is looking into inflight connectivity. The cabin has been designed to represent a “casual urban cafe with the embracing freshness of a forest in Spring”. Whilst we can’t fully understand what that is supposed to impart, the finished product is airy, refreshing and light. A light fresh green is predominant here, matched with neutral putty finishes, providing a calm and serene environment. We like the trims of birch wooden veneer, found on the on the seat tables and golden walnut veneer in the lavatory flooring. But this isn’t a simple green cabin. “I wanted to incorporate a touch of traditional Japan in a way that complements the fresh and contemporary ambience of the cabin overall. Forward/rear partitions of each zone have a pattern adapted from traditional Japanese Katagami, which are hand-crafted paper stencils used for making kimono patterns. For hundreds of years there have existed many, many thousands of patterns,” said LIFT’s Daniel Baron on the design. According to CAPA, with its new premium A330s Skymark aims to differentiate itself in the high yield domestic market from ANA and JAL. Both ANA and JAL have cramped domestic cabins (despite averaging below 70 percent load factors) and the A330-300s will enable Skymark to grow capacity on trunk routes to and from slots-constrained Tokyo Haneda. Skymark’s move upmarket also comes as part of a wave of new low-cost competition in Japan from LCCs with lower cost bases than Skymark, as the fear is that without change Skymark will get caught in the middle of the LCCs and full service ANA and JAL: more expensive than the LCCs but without the perks of legacy competitors. Furthermore, at 271 seats on Skymark’s A330-300, the aircraft is on par with other operators’ multi-class configurations, while the Premium Economy-only product will have mass-market appeal owing to its lower cost. Founder of airlinetrends.com. Spends his day monitoring the global aviation industry for commercial innovations in response to changing consumer behaviour. Besides working with clients in the airline industry, Raymond also has a part-time position as consumer trends analyst at leading consumer trends agency trendwatching.com.